A very nicely done little figure. Great alt mode, a fun transformation and a great robot mode. Highly recommended. Definitely one of the best Commander class figures in the DOTM line. I love how it really resembles the G1 version, but with more articulation! 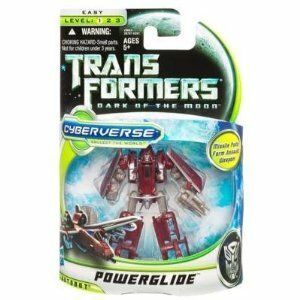 Love my powerglide. Nice g1 coloring and is actually very similar to the g1 powerglide. Transforms very easily. Another great scaled down Transformer. Sports a G1-esque paint job and face sculpt. Comes with a pair of attachable missile pods. The transformation is very simple and the end result looks great! Highly recommedned! Should still be easy to locate at retail, perhaps at a discounted price as most stores are trying to clear out their DOTM toys these days. This is one heck of a nice iteration for Powerglide. Nice overall look, good transformation and well armed. This is one of the best Cyberverse figures EVER!!!!! His transformation is better than a lot of deluxe class figures and his alt mode is very realistic right down to the wing mounted missiles that transform into two handguns. This is a must have. A great movie style homage to the G1 character. All he needs is a bit of love, and he's be even more perfect!